But there's actually a great deal of variation in the size of mormyrid brains. These differences provide an opportunity to look at what's behind the bulk. Researchers from Washington University in St. Louis have mapped the regions of the brain in mormyrid fish in extremely high detail. 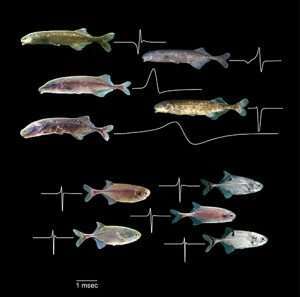 In a new study published in the Nov. 15 issue of Current Biology, they report that the part of the brain called the cerebellum is bigger in members of this fish family compared to related fish—and this may be associated with their use of weak electric discharges to locate prey and to communicate with one another. The size finding in itself is not particularly surprising for those who follow this fish, said Bruce Carlson, professor of biology in Arts & Sciences. "It had almost become a truism," he said. In mormyrids, at least, the thinking went, "big brains mean big cerebellums." As brains get bigger, do all regions of the brain scale up in a predictable way? Or does natural selection act independently on separate regions of the brain—such that certain parts of the brain become enlarged in animals that have extra reasons to use them? "When you look at human brains, the cerebral cortex has become this giant part that has engulfed the other regions of the brain," said Kimberley V. Sukhum, first author of the new study, who recently completed her Ph.D. in biology at Washington University. She works as a postdoctoral researcher at Washington University School of Medicine in St. Louis. "We see something similar with the cerebellum in the mormyrids," Sukhum said. "But it wasn't known how this region had gotten so big—or even if all of the species had a very big cerebellum." Sukhum and Carlson used micro-CT technology to collect full scans of the soft tissue of the fishes' brains, then painstakingly identified the landmarks that delineated distinct regions within them. 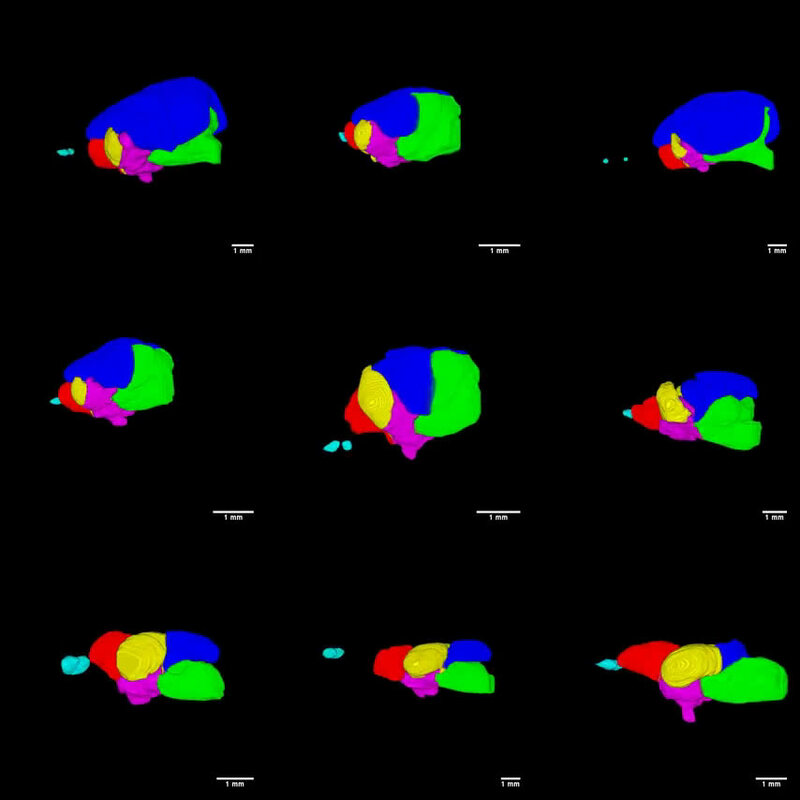 The 3-D maps they created allowed them to measure and compare the volume of individual regions of the brain with great precision. "Here, we see the mosaic increases only in the mormyrids, and not in the outgroups," Sukhum said. "And one of the things that we see in the mormyrids and not the outgroups is the electrosensory system. There is a potential relationship between these two things." Some of the mormyrids that they measured had extremely large brains—up to three times bigger than the smallest-brained mormyrids in the study. Despite this difference in total size, there was no evidence of mosaic changes in the cerebellum within the group. This is evidence that mosaic shifts are not just the result of evolving a big brain. Instead, the shifts are likely related to the evolution of novel traits, such as the electrosensory system. This study cannot say for sure why mormyrids have such big cerebellums—only that they do. But Carlson has a hunch. He thinks this part of the brain might be doing the lion's share of the mormyrid's work with motor planning, and also with how the fish anticipates the sensory feedback it will receive as it moves about and sends out electrical pulses. "There's a lot more planning and consequences to deal with than for your average fish," Carlson said.